The Ontario government adds a ban on cosmetic eye tattoos to a proposed patient care bill after an Ottawa woman nearly lost her eye. The Ontario government has added a ban on cosmetic eye tattoos to a proposed patient care bill after an Ottawa woman nearly lost her eye. 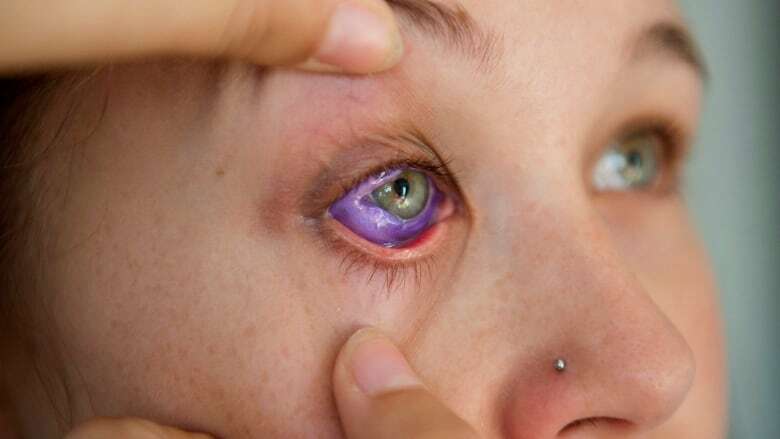 An artist without proper training tattooed the white of Catt Gallinger's right eye purple in an Arnprior, Ont., studio on the night of Sept. 5. The procedure, called scleral pigmentation, is made by lancing a small needle into the top layer of the eye and injecting diluted ink. The process and ink formula are both considered cosmetic and are currently unregulated by the province. Within hours, Gallinger said she was in pain as the ink leaked from her eye. That pain hasn't stopped despite three months of consultations, medication and attempts at surgery. "My cornea is thinned out from lack of moisture because the lump [of ink] directly interferes with my lid closing properly," she said Tuesday. Gallinger has to administer artificial tear drops every 15 minutes in the infected eye. If her cornea ruptures, doctors said she'll lose the eye. "I have my moments where I'm like, 'Just cut it out and be done with it.'" In an effort to avoid similar cases, the Eye Physicians and Surgeons of Ontario (EPSO) proposed banning cosmetic eye modification, including tattooing and jewelry, in a letter to Health Minister Eric Hoskins. They later made a presentation to a government committee. The procedures would become illegal unless performed by a regulated health professional. Currently, there are several medically approved tattoo procedures to improve eyesight or cosmetically reconstruct eyes after an accident. "We would rather be leaders in legislation promoting eye safety and banning eye tattoos than leaders in how to deal with the complications associated with eye tattoos," Dr. Jordan Cheskes, president of EPSO and the doctor who proposed the motion, said. "The best way to deal with this is legislate a law against it." Cheskes said he hopes the legislation will spark change in other provinces. Ontario is currently the only one working to ban eye tattoos. Several MPPs said the photos of Gallinger's eye shown to the committee were upsetting. One remarked he'd be skipping breakfast after the meeting because of them. The proposal received unanimous support and has since been included in Bill 160, which is seeking to change the laws around patient protection. The bill is currently with the committee. "Very clearly, our job is to protect the public," Soo Wong, the MPP in charge of the file, said. "Some people call it art, call it whatever you want, it's risky." Gallinger said she's anxiously awaiting the passing of the bill. "Eye tattoos shouldn't be done, it's just not safe," she said. Though happy others will be spared her pain, Gallinger said she wishes action would have been taken before. "I definitely think a bill would have kept me safe, amongst others, long before now. "Generally these things don't happen until someone has something serious happen."